Sphinx (ARL-24) was laid down as LST-963 on 20 October 1944 by the Bethlehem Steel Co., Hingham, Mass. ; named Sphinx and redesignated ARL-24 on 11 September 1944; launched on 18 November 1944; converted into a landing craft repair ship at the Merrill Stevens Drydock, Jacksonville, Fla.; and commissioned on 10 May 1945. Sphinx completed fitting out and proceeded to Norfolk for sea trials and shakedown in Chesapeake Bay. 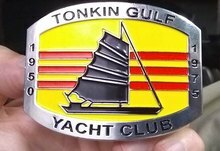 On 12 June, she sailed for the west coast; transited the Panama Canal on 23 June; and proceeded via San Diego, to San Francisco. She was assigned to the Amphibious Forces, Pacific Fleet, and ordered to Hawaii. Sphinx arrived in Pearl Harbor on 31 July and repaired craft there until 27 August when she sailed for Adak, Alaska. Before she reached Adak, her sailing orders were modified, routing her to Japan. She arrived at Mutsu Bay, Honshu, on 14 September and began repairing and refitting minesweepers. Sphinx moved to Yokosuka on 20 November and sailed for Saipan on 3 December 1945. She operated in the central Pacific islands until entering Pearl Harbor on 9 January 1947 en route to the west coast for decontamination. The ship had participated in Operation Crossroads, the atomic bomb tests at Bikini Atoll in the Marshalls from early April to 29 August 1946. Sphinx arrived at San Pedro, Calif., on 22 January where she was decontaminated and prepared for inac-tivation. She was placed out of commission, in reserve, on 26 May 1947. The outbreak of hostilities in Korea created a need for Sphinx's repair facilities in the Far East. She was recommissioned on 3 November 1950. After outfittingand holding shakedown training, she stood out of San Diego on 17 August 1951 and proceeded via Pearl Harbor to Japan. Sphinx arrived at Yokosuka on 29 September and operated from Japanese ports until 7 May 1952. During1 this time, she repaired and serviced fleet units that were being used in Korea. The ship returned to San Diego on 4 June 1952 and operated along the California coast until redeployed to the Far East from 3 March to 9 December 1954. Sphinx operated along the west coast during 1955 and, on 31 January 1956, was again placed out of commission, in reserve, and berthed at San Diego. In January 1967, orders were issued to reactivate Sphinx for use in Vietnam. She was towed to New Orleans, La., in February and, on 16 December 1967, placed in commission. The ship sailed for the west coast on 8 January 1968 and arrived at San Diego on 23 February. On 22 April, Sphinx and Cohoes (AN-78) sailed for the western Pacific. The ships made port calls at Pearl Harbor, Kusaie, Guam, and Subic Bay. Sphinx sailed independently from there on 6 June and, four days later, arrived at Vung Tau, South Vietnam. 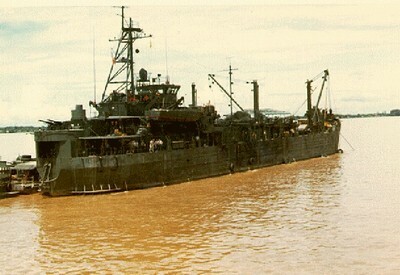 Sphinx moved to Dong Tarn, on 11 June, and was assigned to the Mobile Riverine Force in the Mekong Delta. Her unit was Task Force (TF) 117 composed of 11 shallow-draft ships and over 150 river assault boats. The repair ship was on a non-rotating basis and, during 1969, had very little time underway. She operated in the Tien Giang and Ham Luong rivers, providing service and support for the riverboats as they engaged in operations against the Viet Cong. The ship sailed from Vietnam on 21 June for a yard period at Sasebo and returned on 25 August. Upon her return to Vietnam, Sphinx operated along the Vam Co River. In addition to her regular duties, the ship served as the tactical operations center of the Can Giouc Interdiction Unit and also developed helicopter capabilities, handling 50 landings before 31 December 1969. She remained in Vietnam until 14 December 1970 when she weighed anchor for a yard period at Yokosuka. On the last day of the year, the ship lost power in both main engines and was adrift 340 miles from Sasebo. On 2 January 1971, Chipola (AO-63) took her under tow for Sasebo where she was repaired. Sphinx was back off Vietnam on 11 March and remained there until sailing for the west coast several months later. She arrived at Bremerton, Wash., on 2 July and prepared to rejoin the reserve fleet. On 30 September 1971, Sphinx was placed in reserve, out of commission, and remained berthed at Bremerton into December 1974. Sphinx received one battle star for Korean service and eight for service in Vietnam.